Apple easily lets you take a screenshot of your iPhone, iPad, or iPod touch. But to record the screen, you’d think it would require a jailbroken iOS device. It’s now possible to record the screen of your device by just downloading an app from the App Store. 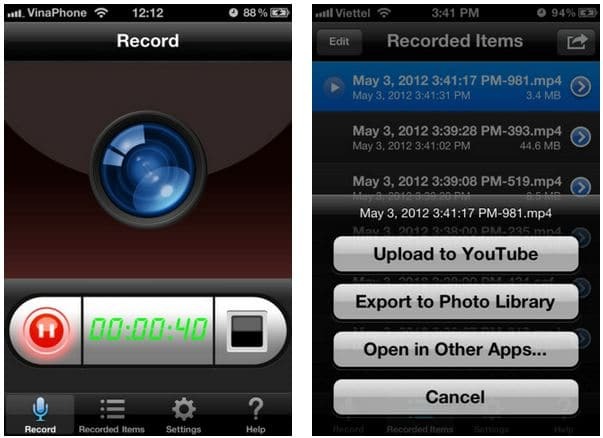 New App Store app (previously on Cydia) Display Recorder records your iPhone, iPod Touch and iPad screen in real-time. The app lets you record directly to high quality H264 mp4. It records video and audio and it even lets you upload the video to YouTube, export it to your photo library, or open it another app. Unfortunately, the app doesn’t record games. Display Recorder is available in the App Store (iTunes Link) $2. It’s compatible with iPhone 3GS, iPhone 4, iPhone 4S, iPod touch (3rd generation), iPod touch (4th generation) and iPad, and requires iOS 4.0 or later.